Finns Point Rear Range Light - Pennsville, N.J. This 115 foot tall iron tower with skeleton support structure was constructed in 1877, at 39° 37' 02" by 75° 32' 03". The iron rings that make up the tower were driven to the site by Army mule trains driven by soldiers. It was automated in 1939, but discontinued in 1951, due to a change in the shipping channel. The keeper's house was demolished in 1977 after being repeatedly damaged by vandals. 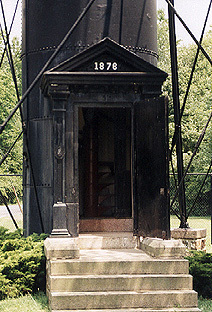 Other than the lighthouse itself, the oil house is the only remaining original structure. In 1981 local citizens formed a "Save the Lighthouse Committee" spearheaded by Mrs. Betty Husarik, a local businesswomen, and successfully lobbied Congress to appropriate funds to refurbish the tower. The lighthouse is usually open the third Sunday of each month from April to October from 12:00 to 4:00 p.m. The lighthouse is on the National Register of Historic Places, and is situated near the junction of Fort Mott & Lighthouse Roads in Pennsville, New Jersey. It is part of Supawna Meadows National Wildlife Refuge.